Children on Texas’ border face separation from family, a culture and language they do not know and frightening legal action. These are families seeking asylum, fleeing from horrific conditions. 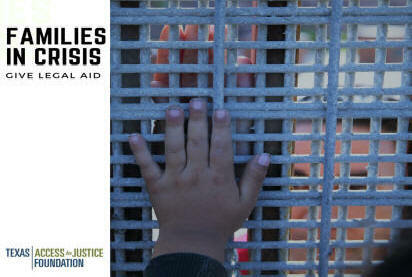 TAJF immigration legal aid providers are doing all they can, given limited resources and being overwhelmed with a staggering increase in legal need. These lawyers are unable to do more and must have help! The Texas Access to Justice Foundation has committed to finding dollars because these children can't wait. TAJF will ensure that the funds are immediately distributed to the areas and programs most in need. Thank you for helping these families and children!